"This is my favorite pasta dish that is very flavorful and full of color." Bring a large pot of lightly salted water to a boil. Add rotini pasta and cook for 8 to 10 minutes or until al dente; drain. 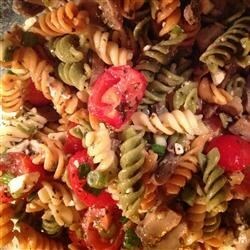 Mix together cooked pasta, olive oil, vinegar, garlic powder, basil, oregano, mushrooms, tomatoes, Feta cheese, green onions and olives. Cover and chill for at least 2 hours, serve cold. I was out of red wine vinegar, so I subbed in balsamic and my guests loved it!